Chanel’s Les Jeans de Chanel Collection for Fashion’s Night Out caused near hysteria among some polish lovers – it’s a trio of blue polishes Chanel released for Fashion’s Night Out on September 8th. These Fashion’s Night Out releases have become a Chanel tradition, and they’re pretty much guaranteed to sell out fairly quickly. Fortunately, the Chanel website worked much better this year than last year. I’ll have swatches of all three, and started with my favorite, Blue Boy. Last year the Chanel website crashed and it was really difficult to order the Khakis de Chanel. Online ordering is my only option (other than calling around to boutiques or stores, which is much less reliable), so I was happy that this year the Chanel website worked really well. In fact, the Les Jeans de Chanel popped up on the website right around midnight on September 8th, so it was possible to order them online even before they were available for sale in stores. I started with Blue Boy, which is the middle child of this trio-it’s darker and more grey than Coco Blue and lighter than Blue Rebel. Blue Boy is a creme and had a nice formula – I did use three coats just to make sure that the color was even and saturated, but the coats went on well. Chanel has a fairly small brush with soft bristles that fan out easily – you just have to be sure not to push too hard and drag earlier layers of the polish when applying. I really like the grey undertones of Blue Boy – it makes the color just neutral enough to wear to work for me, but it still has an edge. This shade picture is most accurate to the color I saw in daily wear – it’s muted and greyish and yet still deep blue – it doesn’t veer into cornflower or purple at all. I was intrigued by the Mood Ring manicure post on All Lacquered Up for Fashion’s Night Out – I like the CND effects polishes but had never thought about combining so many of them in one nail look. Blue Boy seemed like it would be a nice base color to try the look with, since it’s fairly dark but has a blue tone that would match some of the shimmer colors. 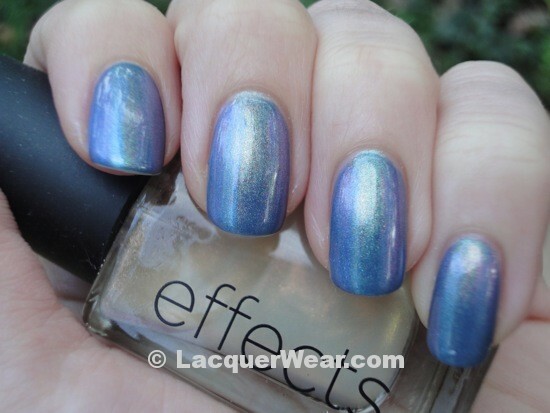 The picture below shows a middle stripe of Emerald Shimmer effect, a stripe of Ice Blue Shimmer on one side, a stripe of Violet Shimmer on the other side, and a coat of Copper Shimmer on top of everything. My picture isn’t the best since there was no sun around here all week, but if you look closely you can see the greenish shimmer in the middle, with a purple or blue shimmer on the sides. The Copper Shimmer on top creates a hazy, diffused look that’s changeable in different light, like the swirling colors of a mood ring. I remember mood rings. They were popular when I was in grade school. I had a mood ring keychain that I bought at Claire’s. I don’t know what was going to make the mood color change happen when it was just on a keychain, though. Chanel seems to have laid in a much better supply of the Les Jeans de Chanel polishes this year than last, at least for the US website. All three are still up on the website at this point, although they probably won’t last long.